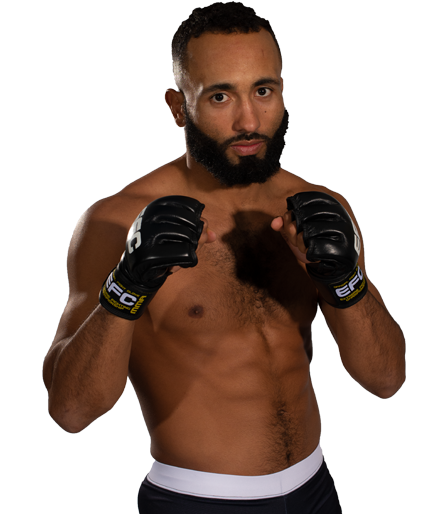 Middleweight champion Garreth ‘Soldierboy’ McLellan kicked fight week celebrations off with an Open Workout exhibition on Saturday, August 22. 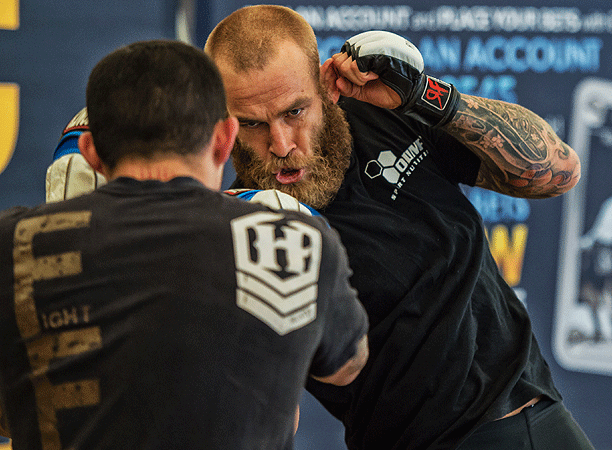 Johannesburg (South Africa) – The buildup to EFC 33: McLellan vs. Du Plessis & Van Staden vs. Smith has begun! Look out for the following events taking place over fight week, as we prepare for Saturday night. 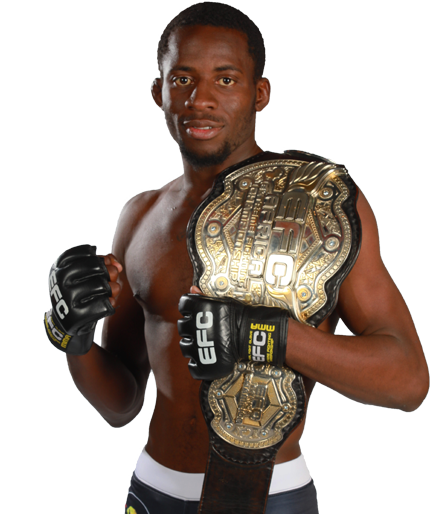 Pictures of fans posing with the EFC belt at Saturday’s Open Workout will be posted on the EFC Facebook page. One lucky tagged fan will win two tickets to Saturday’s event. Donavin & Wesley Hawkey, Baldwin Mdlalose and Abdul Hassan join East Coast Radio for ‘Trending Tonight’ from 21h30. 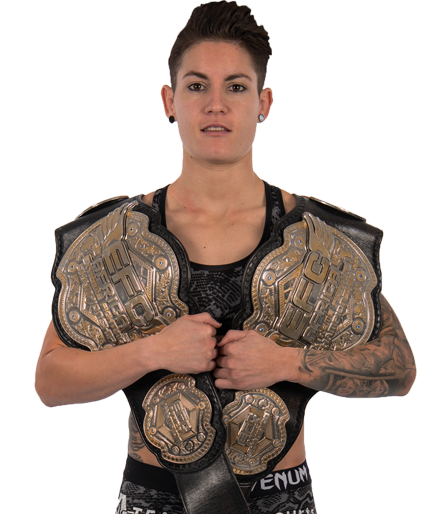 Watch Saturday’s Open Workout Video, released on efcafrica.com, Facebook and Twitter, including exclusive footage of EFC 33’s biggest stars wowing a Durban crowd for the first time. 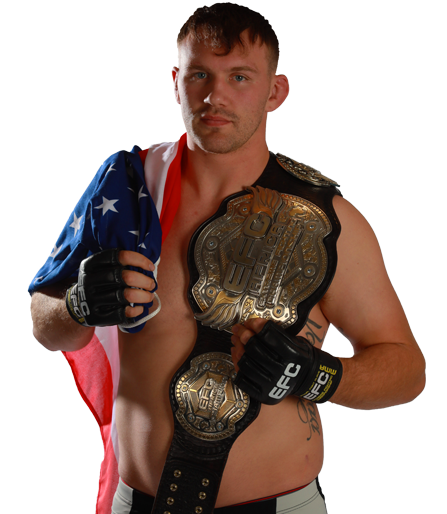 Soldierboy talks fight night with Andrew Hope on UJFM 94.5, from 18h30. 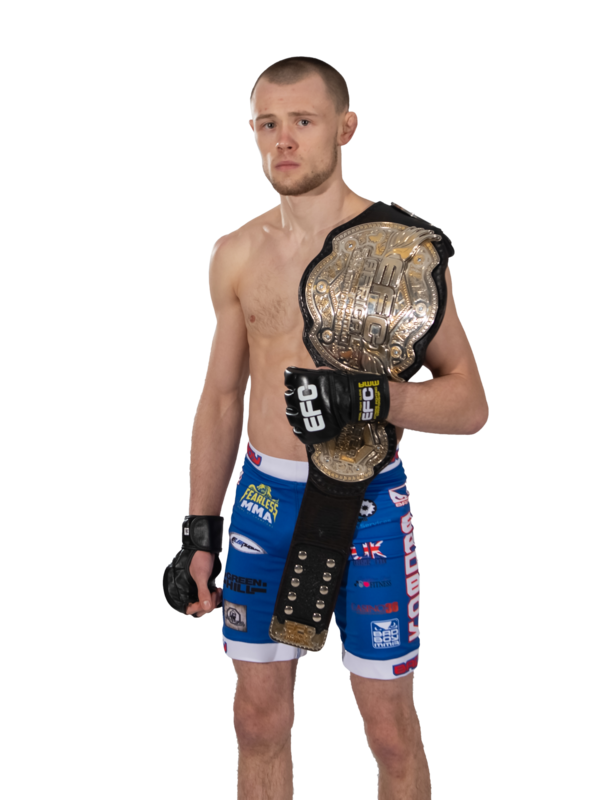 Soldierboy joins East Coast Radio to talk fight night, time to be announced. 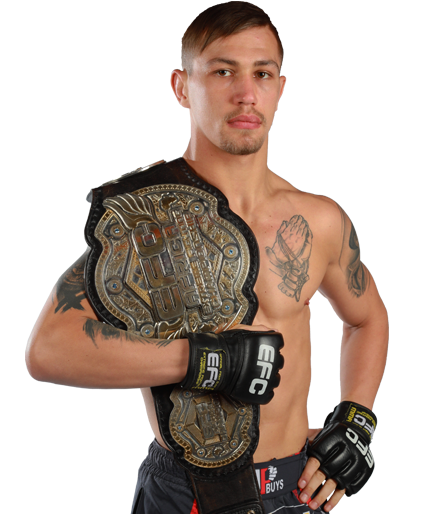 EFC commentator Dirk Steenekamp discusses his EFC 33 picks with Robbie Kruse on Jacaranda FM, from 07h30. 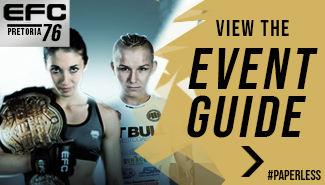 Taking place at the Durban ICC at 14h00, fight fans will witness all EFC 33 athletes hitting the scales and facing off ahead of fight night. Entrance is free of charge, and, as always, huge EFC merchandise giveaways will take place. Fight fans are invited to join athletes, media, and the EFC team for a Post Weigh-in, Pre EFC Party. Taking place at Cotton Fields (7 Mclausland Crescent, Umhlanga Rocks), from 18h00. 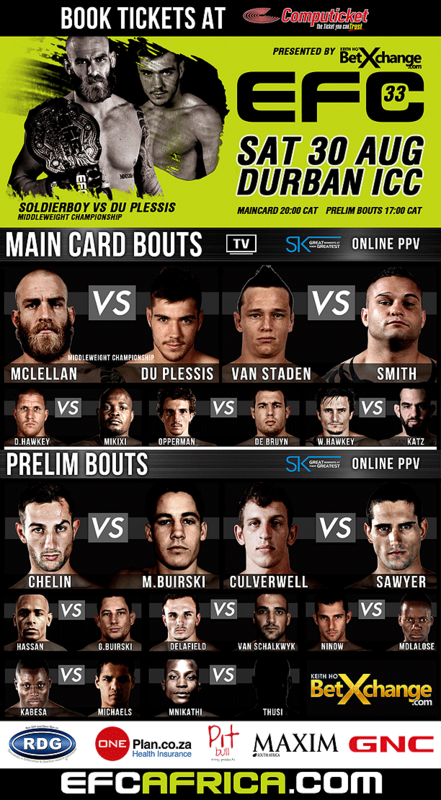 EFC 33 kicks off at the Durban ICC from 16h45, with all of Durban’s finest MMA athletes in action. • EFC 33 Post Event press conference. 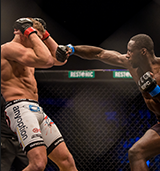 EFC 33’s top athletes discuss their fights and the future, immediately after EFC 33, in an event open to the public. The Official Soldierboy & The Punisher After Party will be held at Taco Zulu (237 Florida Road), kicking off after the EFC 33 event. The Hawkey’s host more after party action at Club Absolute (258 Florida Road), kicking off after the EFC 33 event.